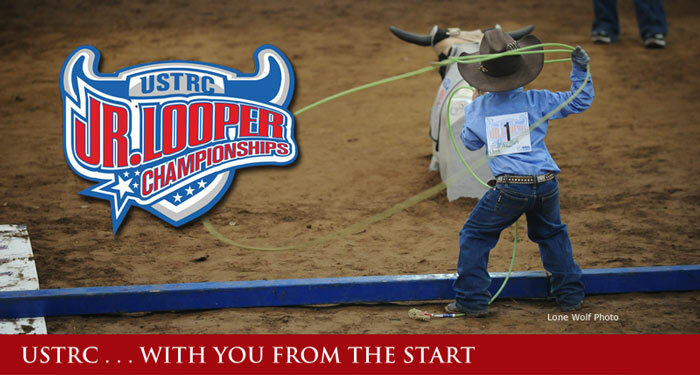 The United States Team Roping Championships Junior Looper program is the perfect start for the young team roper. With leveled competition and great prizes, you’ll want to get your youngsters started today. Best of all. . . It’s free to Join! What is a junior looper? Youth 12 and under are eligible to compete in the popular “dummy” roping competitions at USTRC team roping events, where youth show off their skills by roping a stationary plastic steer model. Junior Looper competition offers three age groups: 6 and under, 7 to 9, and 10 to 12 years of age. By division, each Junior Looper takes a turn standing behind a line, which is moved progressively further away from the roping model, to see who can reach the greatest distance in order to make a qualified catch. Membership in the USTRC Junior Looper program is free to youth 12 and under and is available when you Contact our Main Office or complete an Application for Membership. A birth certificate and social security number are required when applying. Youth are eligible to compete in Junior Looper competitions until their 13th birthday. There is no entry fee for Junior Looper events. Must bring Junior Looper Card or copy of birth certificate to receive prize. Three age groups: 6 and under, 7-9, and 10-12. Junior Loopers may not enter below their age division. No Junior Looper may win more than 1 buckle in a USTRC season at sanctioned events (National Finals excluded). Season is defined as those events between November 1 and October 1 of any year. Any Junior Looper that has ever won a USTRC Trophy saddle or a Junior Looper Trophy saddle will not be eligible to compete at the USTRC Finals in the Junior Looper ropings. Keep in mind the Junior Looper Program is a free program developed for the youth in the sport of team roping. The USTRC Staff-appointed conductor of the roping will ensure to the best of their ability that the event is conducted fairly. Please comply with the requests and suggestions of the conductor(s) of the event. Junior Looper parents are invited to watch, but not participate. The Junior Looper Championships are held annually at the National Finals of Team Roping where hundreds of youth participate for their chance to win many awards and prizes. Entry to that event is free. Use of this Web site constitutes acceptance of the USTRC Online User Agreement.